A powerful synergy of high performance and low profile, the Manix 2 Black Blade is a reliable, full-service folding knife with a stealthy non-reflective finish. 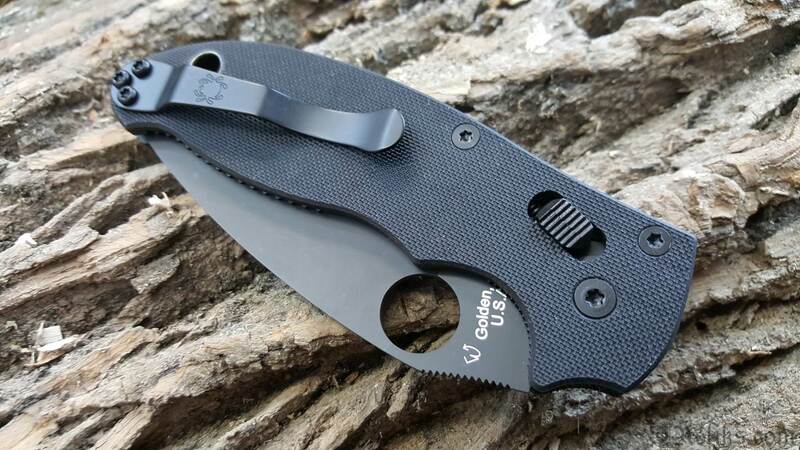 Its broad, full-flat-ground blade is precision machined from premium CPM® S30V® particle metallurgy stainless steel and coated with an ultra-durable black tungsten DLC (Diamond Like Carbon) coating. Matching areas of jimping (textured grooves) on the thumb ramp and the index-finger choil complement the handle’s refined ergonomics to offer an amazingly secure, comfortable grip. Its handle is constructed with full stainless steel liners, a stainless steel back spacer, and textured black G-10 scales. It houses the knife’s high-strength Ball Bearing Lock mechanism, which consists of a hardened steel ball bearing encased in a polymer cage. When the knife is opened, a spring plunger drives the ball bearing forward onto a ramp on the blade, wedging it securely open. Pulling back on the cage releases the lock and allows the blade to pivot smoothly closed. Both opening and closing are easily performed with either hand and without ever placing your fingers near the blade’s edge. A reversible hourglass pocket clip supports left or right-side tip-up carry, complementing the blade’s Trademark Round Hole and lock mechanism to make every aspect of the knife’s carry, deployment, and operation completely ambidextrous. 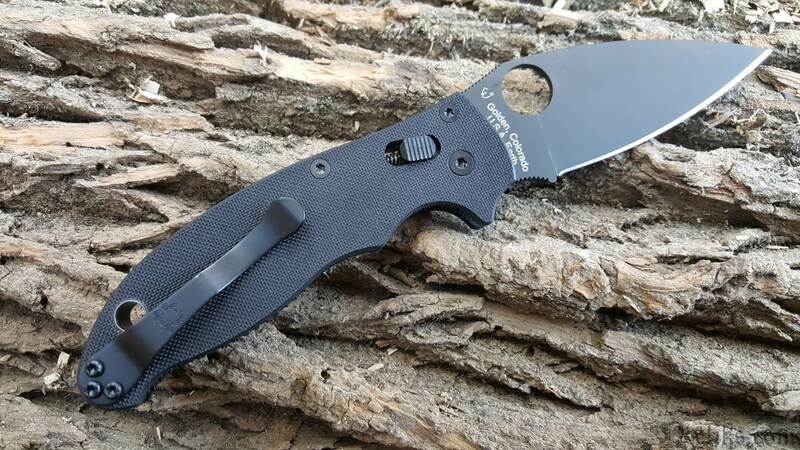 Like the blade, all metal components of the handle feature a durable, non-reflective black coating that makes the Manix 2 Black Blade ideal for use in tactical environments where light discipline is critical. Spyderco Manix 2 Knife - Matching areas of jimping (textured grooves) on the thumb ramp and the index-finger choil complement the handle’s refined ergonomics to offer an amazingly secure, comfortable grip on the Spyderco Manix 2. 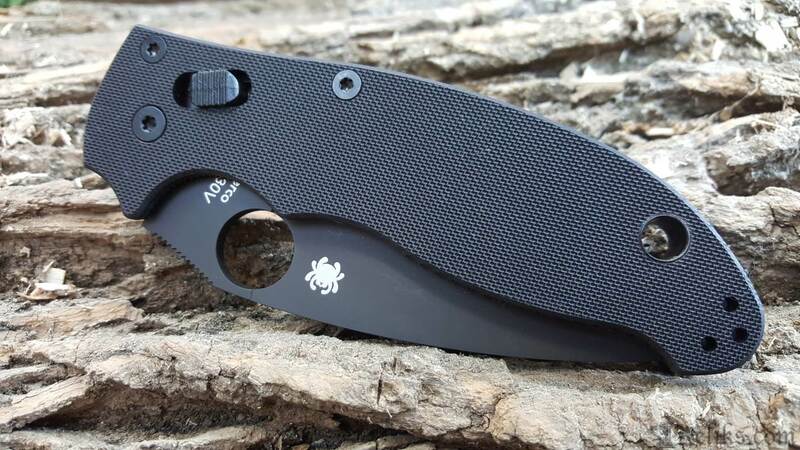 Manix 2 Black Blade - A powerful synergy of high performance and low profile, the Spyderco Manix 2 Black Blade is a reliable, full-service folding knife. Black Manix 2 - When the knife is opened, a spring plunger drives the ball bearing forward onto a ramp on the blade, wedging it securely open. Pulling back on the cage releases the lock and allows the blade to pivot smoothly closed. Both opening and closing are easily performed with either hand and without ever placing your fingers near the blade’s edge. 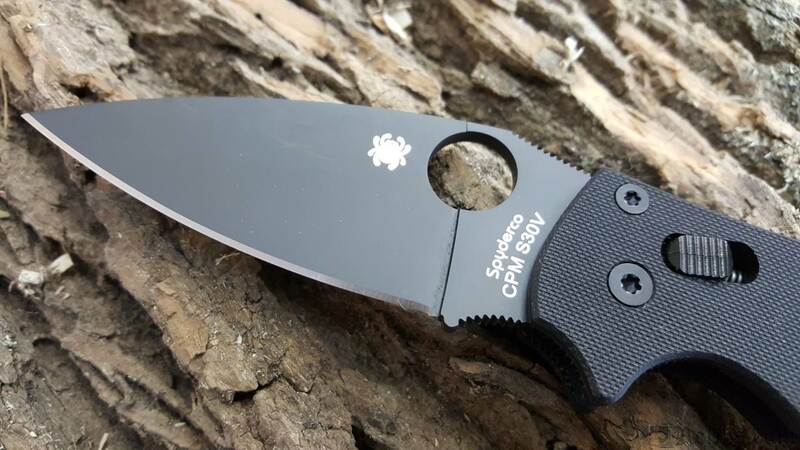 Cpm S30V Blade - Like the blade, all metal components of the handle feature a durable, non-reflective black coating that makes the Manix 2 Black Blade ideal for use in tactical environments where light discipline is critical. 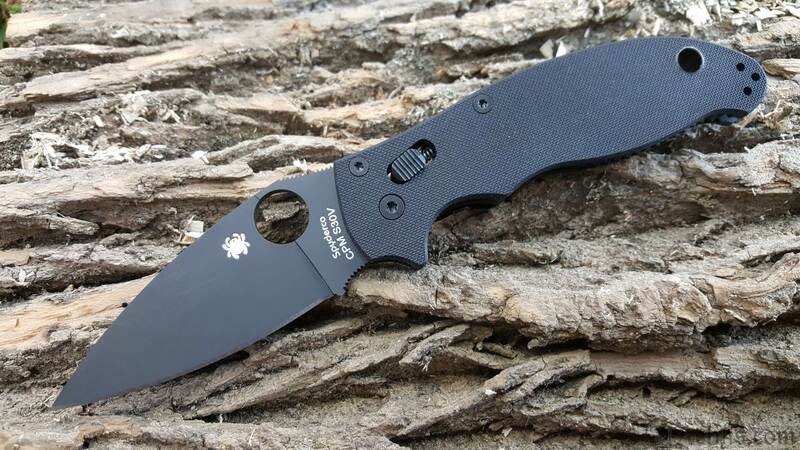 Manix 2 Spyder Hole - A reversible hourglass pocket clip supports left or right-side tip-up carry, complementing the blade’s Trademark Round Hole and lock mechanism to make every aspect of the knife’s carry, deployment, and operation completely ambidextrous. 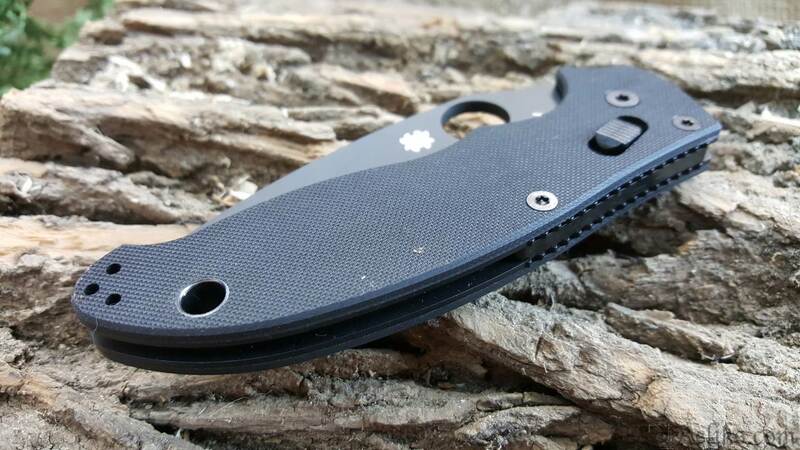 Manix 2 Ball Bearing - The black G-10 scales house the knife’s high-strength Ball Bearing Lock mechanism, which consists of a hardened steel ball bearing encased in a polymer cage. When the knife is opened, a spring plunger drives the ball bearing forward onto a ramp on the blade, wedging it securely open. 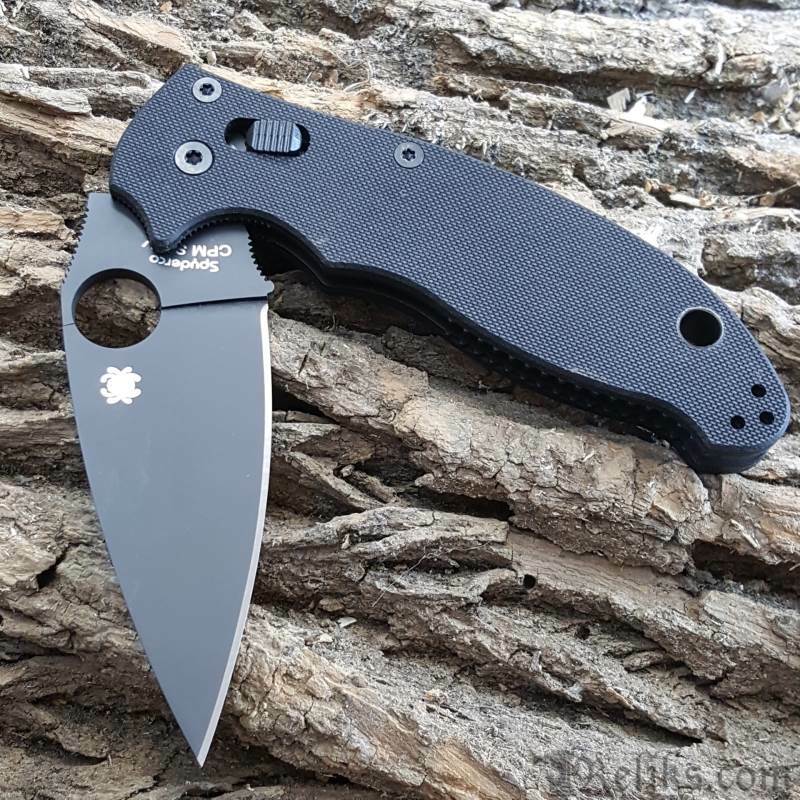 Manix 2 Lanyard Hole - Its handle is constructed with full stainless steel liners, a stainless steel back spacer, and textured black G-10 scales.